Bitcoin: Are You Feeling Lucky? The popular cryptocurrency, bitcoin, has tumbled greater than 50 percent since its all-time high set just a month ago near $20,000. Since then, it has traded as low as $9,000 before rebounding modestly back over the $10,000 mark. The short story of bitcoin (XBT) is powerfully illustrated by its graduation from its initial use case as an easy, inexpensive medium of exchange to an erratic and highly speculative risk asset which scarcely resembles anything more. And despite the chance that it regains steam, it is steeped equivalently in bubble territory at $9k as it is at $20k or even $100 or $100k. 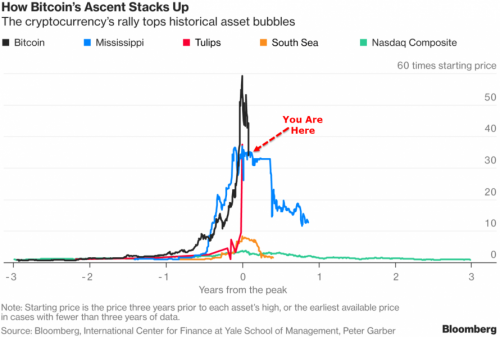 Plainly, it is a bubble at nearly any price. The only difference is the anchoring effect which seduces the investor into interpreting the drop as a buying opportunity. So while the fundamentals and the use case haven't dramatically changed since the decline, the greedy investor assumes that the price has dropped because of reasons unrelated to its future viability. In its most basic form, the crypto variant is simply too expensive, insufficiently usable and far too volatile to qualify as money, the latter of which has always historically assumed the utility of a commodity in advance of achieving its sweeping endorsement as a money. And as the famed bitcoin name permeates investor forums, water cooler talks and social media news feeds, the mirage expands by social certification. Over this time, so many bidders appear to have been purely sucked into the get-rich-quick mania without a remote understanding of the technology or the arcane philosophy behind it, much less even a cursory history of money. This development is neatly epitomized by one Facebook hashtag that I recently observed: #HereIsToHopingWeWillBeFutureMillionaires. This is the quintessential hype which surrounds any bubble, which was just as evincibly true with the dot-coms as it was during the housing boom. Oddly enough, those bubbles popped not long ago, yet those memories appear to have been erased, or temporarily suspended, in favor of fantastical fantasies of riches. Too many people, it seems, have begun to pay strict attention to simple price movements, confused for discount buying opportunities, when fundamentals and sustainable usability have proven to be far more influential factors in long-run prices, which today point to far greater downside potential in bitcoin than the intoxicated investor cares to acknowledge or admit. In fact, prices are not independently important in bubbles, though they tend to be characteristic of them. As such, a bubble can exist at a relatively low dollar amount just as it can at a relatively high one. A bubble is merely the stretch from the property's justified or intrinsic value. In this case, bitcoin has strayed far from its course as a veritable medium of exchange to instead trade as a highly speculative risk asset, proving ubiquitously more useful as a tradable unit than anything else. In summary, bitcoin lacks long-run scalability, as its price model is prohibitively expensive and its enormous volatility lends itself far more to speculation than to employment as a trustable store of value: the antithesis to money. In fact, tech-savvy millennials have boasted their smarts in riding this wave, all the while waving the banner to entice others as they brand bitcoin the way to riches and, as a secondary mention, the future of money. But how are these investors treating the asset? Are they paying their bills with bitcoin? Are they being paid in bitcoin? Are they holding bitcoin as a hedge against inflation or on principle against the evils of fiat currencies? The lion's share of evidence shows that the average bitcoin investor is treating the asset as an alternative to the stock exchange, essentially confusing stocks with unstable units of account. Of course, cryptocurrencies don't pay dividends to shareholders, so a comparison between the two ought to be hardly mentionable, but the speculation component clearly merits an elaboration. As mentioned before, bitcoin fails even the commodity test, so its success is completely predicated upon the Greater Fool Theory, the wishful notion that another buyer will assign a higher appraisal to the coin. With stocks and commodities, you have a real ownership over equity or property. With bitcoin, you have an option to sell to a higher bidder until, of course, those bidders become sellers in their own right. You own nothing beyond that uninsured option. The new zeitgeist, captured eloquently by an honest article from Forbes, hinges upon day-to-day ambivalence about the viability of the crypto market. The author of this particular Forbes article, entitled I Just Lost $3,000 Investing in Ripple (and Tron), And It's A Dangerous Feeling, writes: "I believed these coins would succeed two weeks ago: am I really so fickle?" This is the foundation of believability constituting the confidence in this market: the anticipation of higher valuations in the future. Once crossed with the grim reality of illusory wealth predicated upon unfounded exuberance, in the form of depreciation, stabilization or plain unpredictability, the premise fades and jaded investors resort to alternatives or simply take their remaining chips off the table. That's because these investors are uninterested in stores of value; they're intrigued by the value proposition of easy access to riches, and they're motivated by envy after witnessing their friends boasting of their fortunes and how effortlessly they amassed all of it. Yet despite all of the success stories and the justifications backing their speculation, as soon as that position is challenged by a violent reversal, the strength of their conviction wanes with it, displaced by fear of losing it all or tamed by desperate dreams about what's to come. All the while, the character of this market has changed, and those blinded by the dazzling upswings have largely missed it. Over time, a notable shift has ensued whereby the bitcoin market has become saturated with increasing numbers of institutional investors. The market is thus highly manipulable by just a small number of holders. These are the modifying distinctions worth considering before you continue to subject yourself to painful losses set to subsidize the gains of those major players and early adopters. You only have to ask yourself one question, as Clint Eastwood once said, being that this is an inordinately speculative market, one of the greatest bubbles in history, which will invariably wipe clean the pocketbooks of its last holders: "Do I feel lucky?" Is Business Responsible for Your Well-Being?